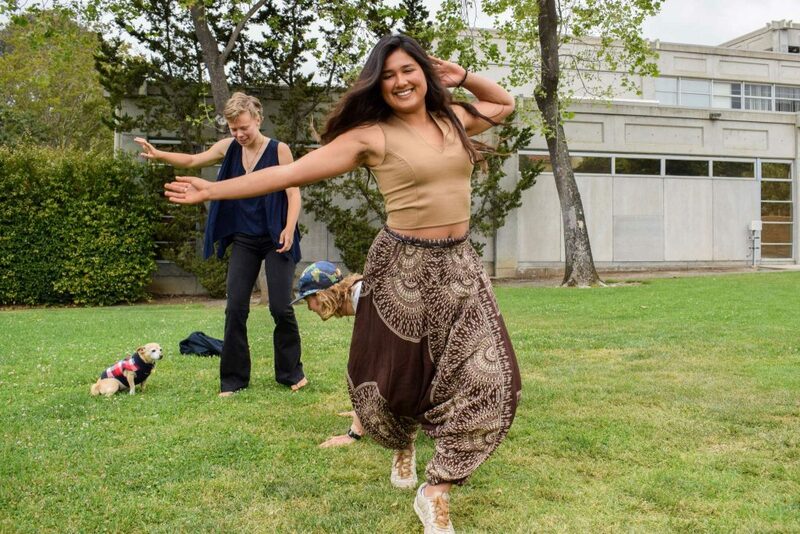 Adam Simon, Jamie Himler and Maya Smigel met on Dexter Lawn Tuesday morning to let go of the day for a moment and practice ecstatic dance. With nothing but a speaker in hand, they invited friends and strangers scattered amongst the lawn to join them in movement. “Good to hear — we need more left feet!” psychology junior Simon said. Ecstatic dance sends the message of inclusivity loud and clear. Rather than perfected, choreographed dance moves, mindfulness and emotion guide the movement. 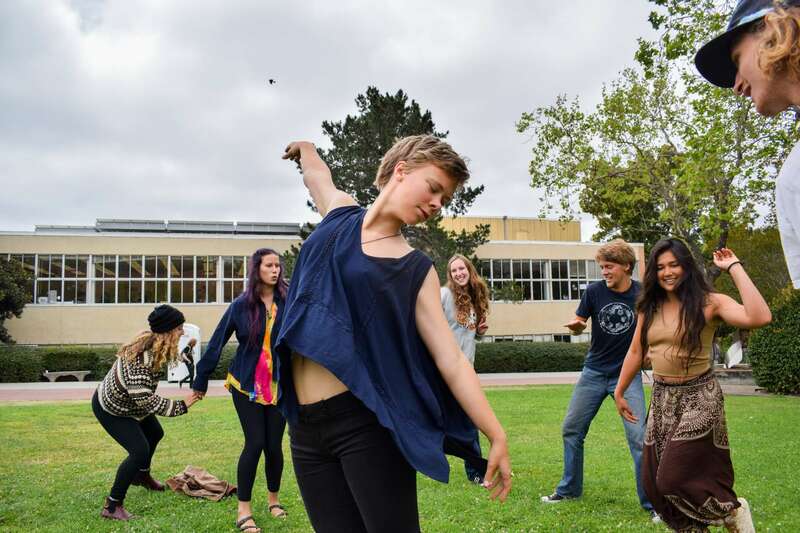 The new Ecstatic Dance and Mindfulness Club aims to spread awareness of ecstatic dance and its meditative nature to the San Luis Obispo community. Ecstatic dance is free-formed movement grounded in the practice of mindfulness. There are no rules or structured choreography that define the practice. Ecstatic dancers simply express their emotions in a single moment through whatever movement that calls. Simon, Smigel and Himler founded the club to give students a space to practice letting go of inhibitions that might hold them back. Smigel, who practiced many different dance styles growing up, said ecstatic dance grants her the most expressive freedom of all the dance forms. That freedom to decide each movement in the moment encourages mindfulness, a crucial component of ecstatic dance. The idea for an ecstatic dance club was born at a Yoga Club meeting. Smigel and Himler, both dance minors, led an ecstatic dance session, and it was met with an overwhelmingly positive response. So they did. They became an official club through Associated Students, Inc. (ASI) in early May. The club held its first official meeting May 17. That night, the club founders practiced their performance for SubSession’s music festival, Life’s A Peach. It was not a typical dance rehearsal; they did not practice a choreographed piece. Instead, they brainstormed a concept, and they practiced expression of that concept through music and movement. They practiced dancing as if nobody was watching. “That improvisational skill is an important practice to be able to feel confident enough to have a 20-minute dance performance in front of a group of people without much structure or choreography,” Simon said. The dancers performed at Life’s A Peach for 20 minutes following an improvisational dance style. The club plans to hold more performances in the future following the same loose structure. The three founders plan to lead the club with the same fluid structure as ecstatic dance. Simon said he invites every student to share their practice of movement or mindfulness in whatever form it may take, whether it is poetry, acro yoga or traditional meditation. What started as a group of three dancers on Dexter Lawn that Tuesday morning soon turned into 10. They welcomed all people and all forms of movement: crawling on the ground, shaking in place, the worm and whatever spoke to them in that moment. 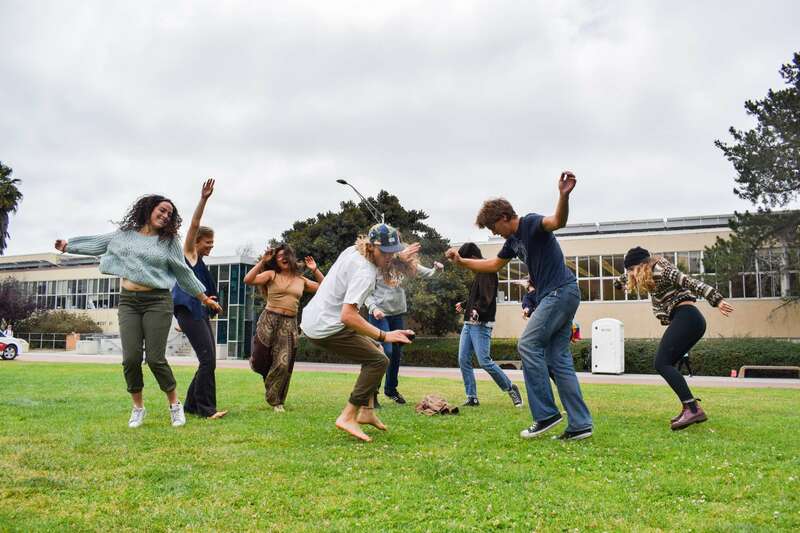 The club hopes to spread the same spirit that produced a dance party from a quiet morning across campus.